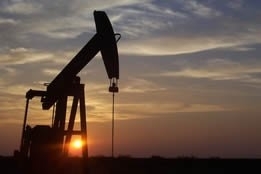 Amplified concern over a global economic slowdown stoked by news on Monday of weak industrial earnings in China and the U.S. caused West Texas Intermediate to drop $1.70, or 3.2 percent, to $51.99 per barrel, its lowest closing price in two weeks. Brent edged below $60 for the first time in two weeks, falling $1.71, or 2.8 percent, to $59.93 per barrel. China's National Bureau of Statistics reported on Monday that profits at industrial companies contracted in December for a second straight month; meanwhile in the U.S., Caterpillar reported disappointing fourth quarter earnings due to tariffs and slower sales in China. John Kilduff, founding partner at Again Capital, remarked, "Those Caterpillar earnings were sort of a canary in the coal mine in terms of industrial activity out there; losses sped up after that hit the tape." Tamar Essner, director of energy and utilities at Nasdaq Corporate Solutions, added that traders' behaviour is "clearly more fear-based, because the facts on the ground right now - that actual current demand data - are still pretty good; but we're getting a lot of negative signs that portend a contraction in the future." Indeed, Rusty Braziel, president of RBN Energy and who correctly predicted several oil price collapses in recent years, told CNBC's Jim Cramer that China is the most important trend happening in the oil market. He explained, "If demand in China is down, if the economy in China is down, that means the total demand for crude oil is going to be down; if crude oil demand drops, then total demand drops, then… crude oil prices are likely to decline, too. "As a matter of fact, that's really the most important thing that's going on right now, and it's what happened back in 2014." Still, Braziel conceded that the crude market isn't exactly headed towards disaster; pointing to the futures curve, he said, "The market has recognized that it was never going to be $70, it was never going to be $40, $42: it's going to be bouncing back and forth between some number around $55 or $60." As if to help reinforce that outlook, Khalid al-Falih, energy minister for Saudi Arabia, told Bloomberg television that his kingdom will reduce oil output once again in February at levels "well below" the production limit under the Organization of the Petroleum Exporting Countries' (OPEC) production cutback deal. He also stated that "Demand will start picking up at the end of the first quarter and into the second quarter," and the impact of OPEC+ reductions "will trickle down into the global markets over the next few weeks."